Some absolutely heart-thumping footage has been released of the Thai cave rescue effort showing expert divers leading the young soccer players to safety through narrow underwater tunnels. In line with the appearance of the boys in the video, it has also been revealed that the youngsters were dosed up with an anti-anxiety drug in order to keep them calm during their harrowing journey through the watery labyrinth. There were even suggestions from some of the dive team that the boys were completely unconscious when they were ushered through the terrifyingly claustrophobic underwater tunnels, but Prayut quickly denied this: “All of the children were conscious during the operation,” he said. He noted that medical professionals were on-hand at different stages of the escape route in order to check pulses and assess the overall physical condition of the boys as they progressed on their treacherous journey to freedom. The boys were equipped with full-face diving masks, which they kept on during the dry sections of the rescue as a result of depleting oxygen supplies in the cave chambers. All 12 boys and their coach escaped their watery prison after spending two weeks tapped deep inside the cave network – they are currently receiving medical attention at a nearby hospital. But it could have been much worse. As the Guardian reports, the water pump system that was draining the chambers and preventing the area where the boys were located from flooding failed just after the last youngster was rescued. “Divers and rescue workers were still more than 1.5km inside the cave clearing up equipment when the main pump failed, leading water levels to rapidly increase, three Australian divers involved in the operation told the Guardian on Wednesday, in the first detailed account of the mission to be published. “All these headlights start coming over the hill and the water was coming … It was noticeably rising,” he added. 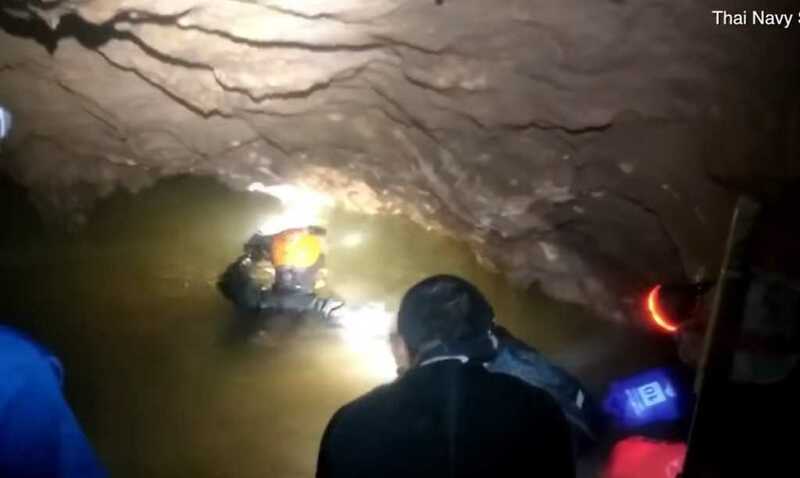 Despite the scare, all 100 rescue workers who remained in the cave managed to scramble to freedom before the water rose too high – including the three Navy SEAL’s and medic who had stayed underground with the boys until they were all rescued.